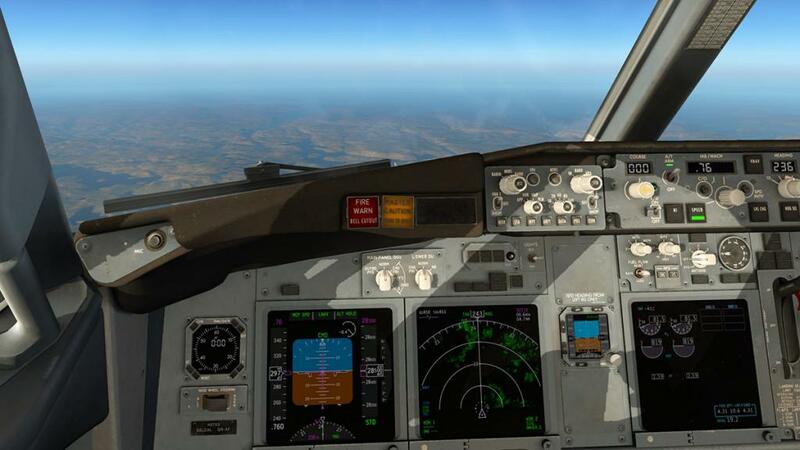 If you have also flown FlightFactor's brilliant Boeing 767, or the later version of their Boeing 757. 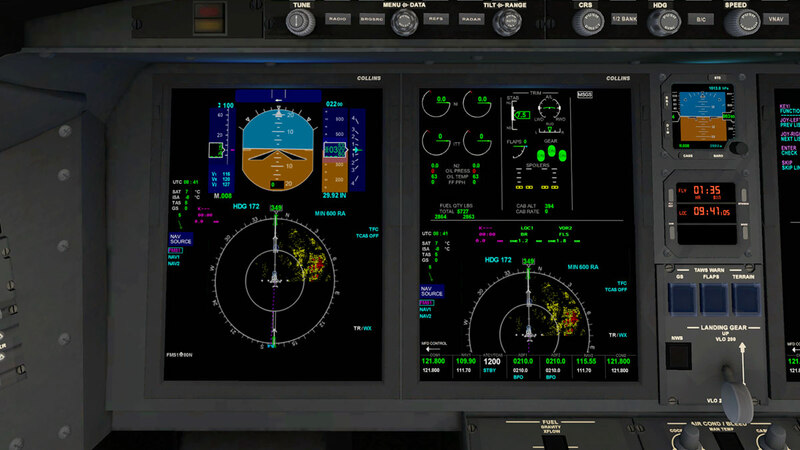 They both came with a great new feature of the terrain display on their Navigation/Map panels. 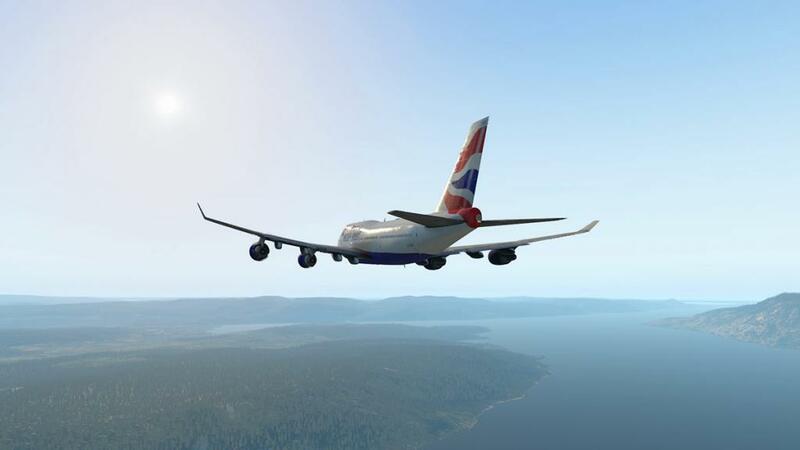 It was and still is very good and the best terrain feature in X-Plane bar non, but for other aircraft to have this feature as it wasn't an option till this plugin became available and the great thing about it is that it can be adopted to almost any aircraft in X-Plane with either the built in Navigation/Map display or without with a popup window. Terrain radars give you elevation detail of the surrounding landscape on your aircraft's Navigation/Map display. 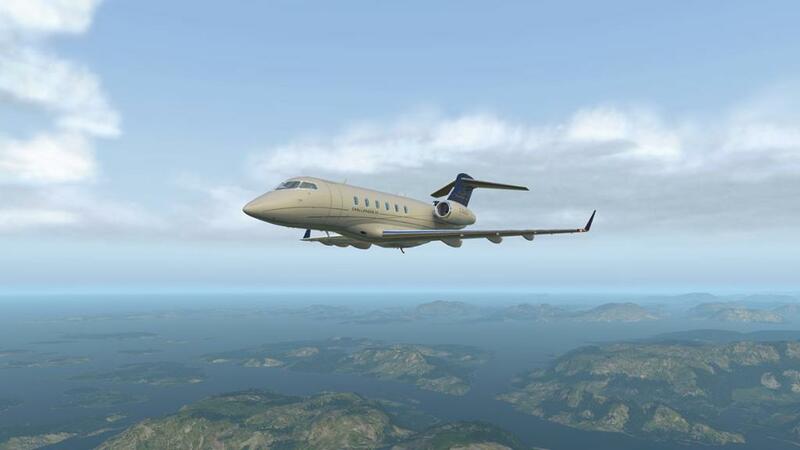 The display will note the elevations in different colours to note the heights of the surrounding mountainous areas. This allows you to navigate or be aware of dangerous high ground and is especially useful in low visual or fog conditions where you can't see or find the areas surrounding you that are masked by this low visibility. Terrain of more than 1,000 feet below the aircraft is coded black. Terrain less than 1,000 feet but more than 100 feet below the aircraft is coded yellow. Terrain less than 100 feet below the aircraft is coded red. Man-made obstacles (e.g., radio towers, power lines, buildings) generally do not appear in a topographical database. There is a donation button on the download page so please support the developers for their excellent efforts!. 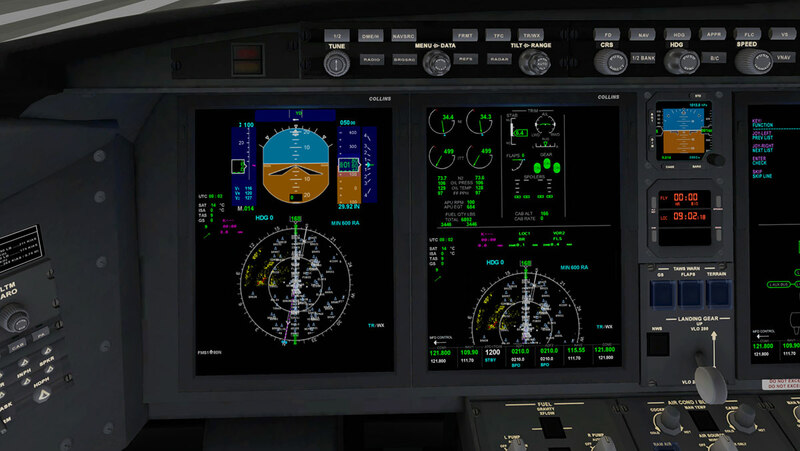 JARDesign Airbus A330 (radar ON/OFF in radar menu or by hot key). Note: radar is turned off if the aircraft's standard radar is displayed! 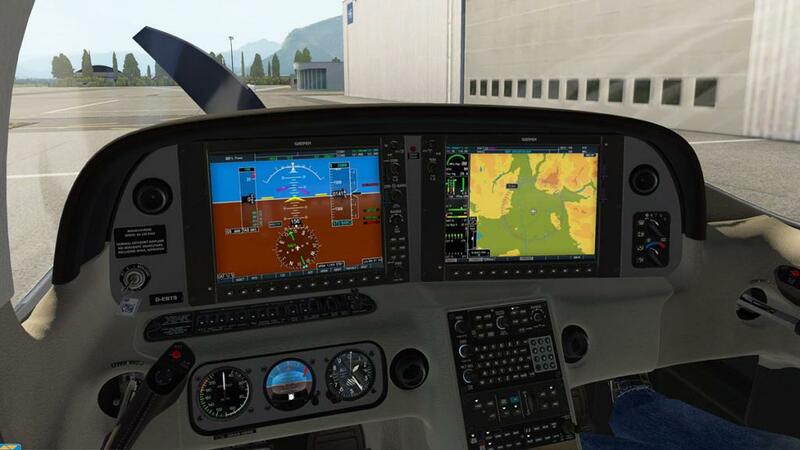 But I am sure that many other developers will quickly install the feature on their aircraft as it is a great addition and the plugin is very easily adopted to most aircraft. 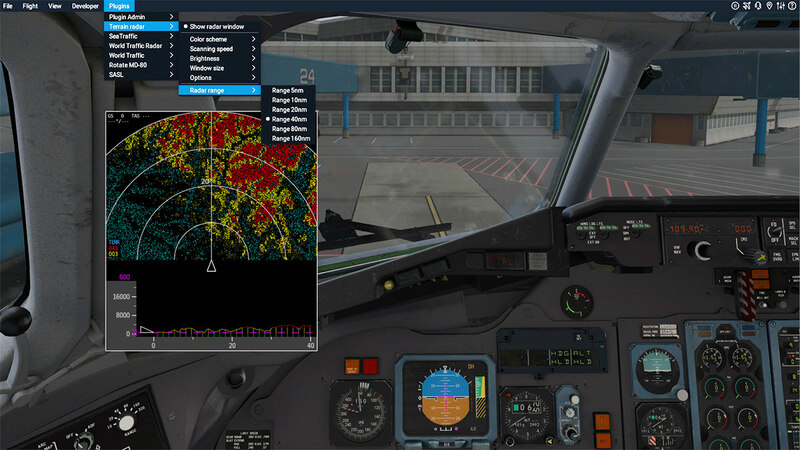 The TerrainRadar menu is accessed via your plugin menu for "Terrain radar"
Show radar window, window size and radar range are currently greyed out for non-use. 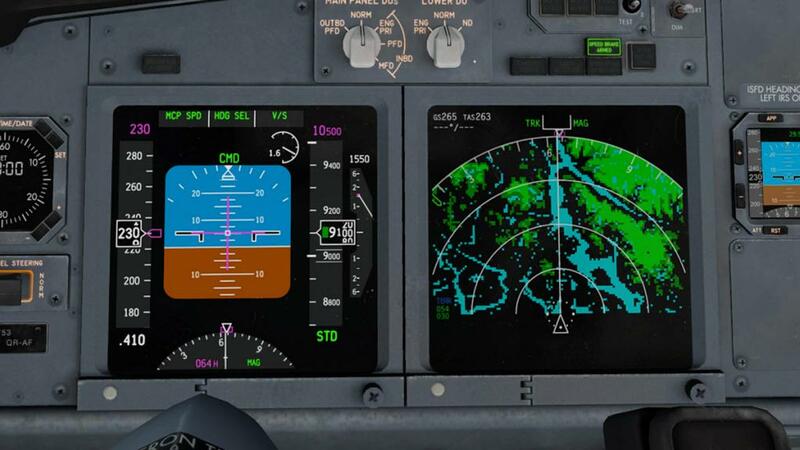 If your aircraft does not have the intergrated display, then it will be shown in "Windowed Mode" and then the radar window, window size and radar range options are then active. You can set the window (popup) on a key set to hide/show the window, change the range (below) and show the EGPWS alerts. 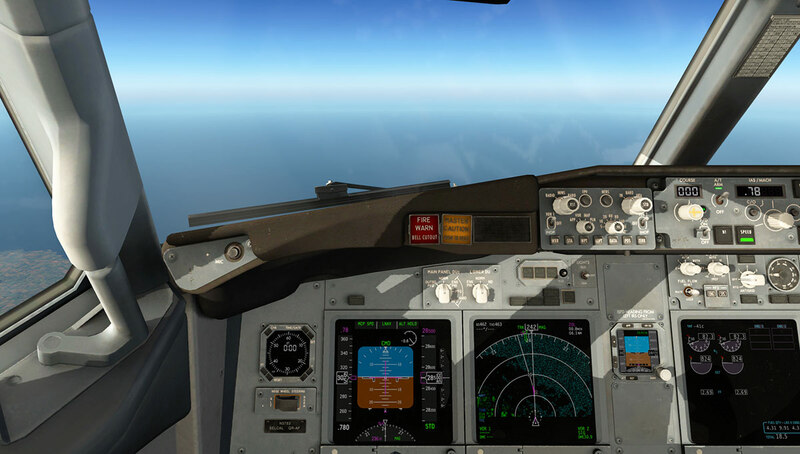 A very nice extra feature is the built in aircraft elevation position indicator at the bottom of the window, but the so called large and small sizes of the window doesn't seem to have any change... the choice to either have the elevation position indicator on or off would be a better option. Clockwise is Solid, Grain and Regular... and all three can be set without the blue which represents water which is the last image lower left. ... and secondly the display brightness from 30% to 100%. 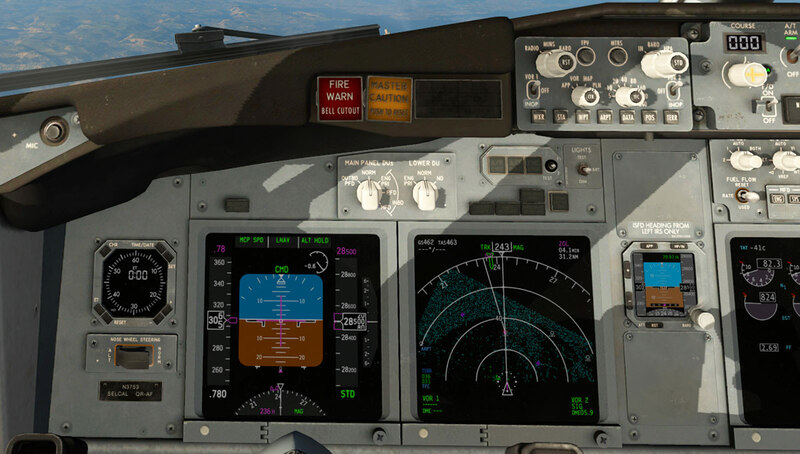 I found 90% was the best level, but the brightness does have a habit of resetting itself back to the default 50% and needs to be checked every time you start or reuse the feature on a new flight. This option is very handy in showing any water under the aircraft, mostly it is very good in defining a coastline and the line between the land and the sea. The display however is limited to the size of the currently loaded X-Plane tile, push the range out high and you will see the tile's straight line square boundaries. 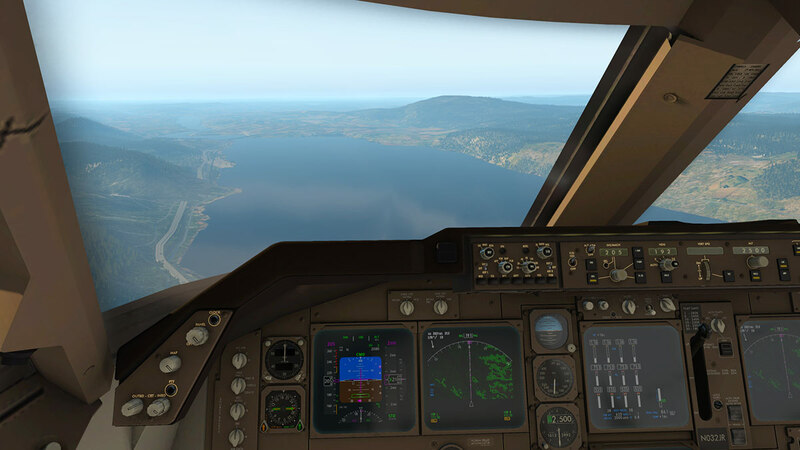 But I really like this option, mostly for what I just noted in leaving one coastline and then arriving at another coastline after the over water flying, it is so good, you can actually define the area of the coastline you will be flying over as you arrive. 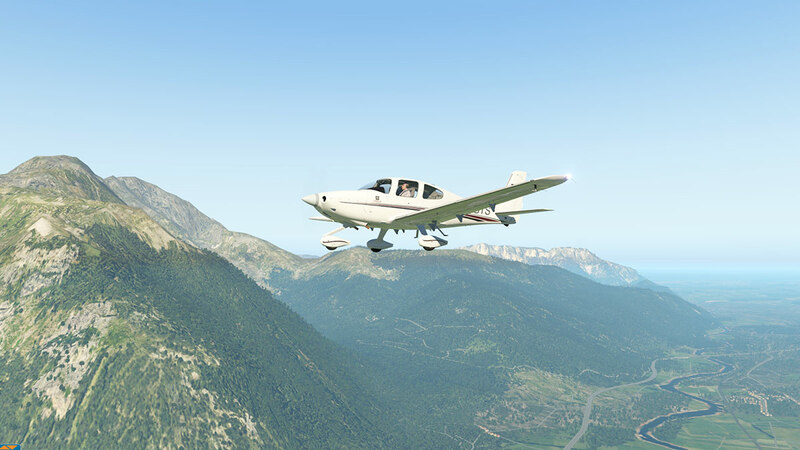 As you go higher to your cruise altitude you will lose the effects of the terrain below, so the "Peaks Mode" will still show the terrain elevation even when you fly at altitude. This setting will tell you if you are too low or are in danger of flying into a rising slope or simply a bigger monster of a mountain. This will show/hide the Range Arcs on your Nav/Map display. 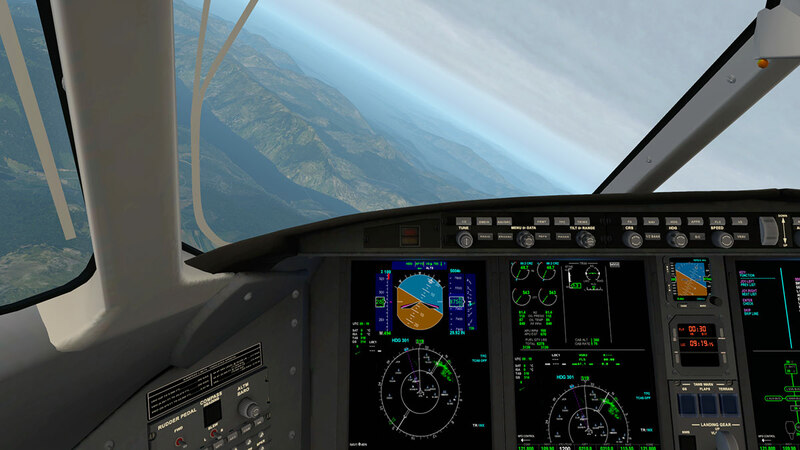 The default X-Plane Navigation/Map display is actually quite still a basic layout even in X-Plane11, in fact you wouldn't see much change from earlier (or very earlier) X-Plane versions and all the way back to X-Plane9®. 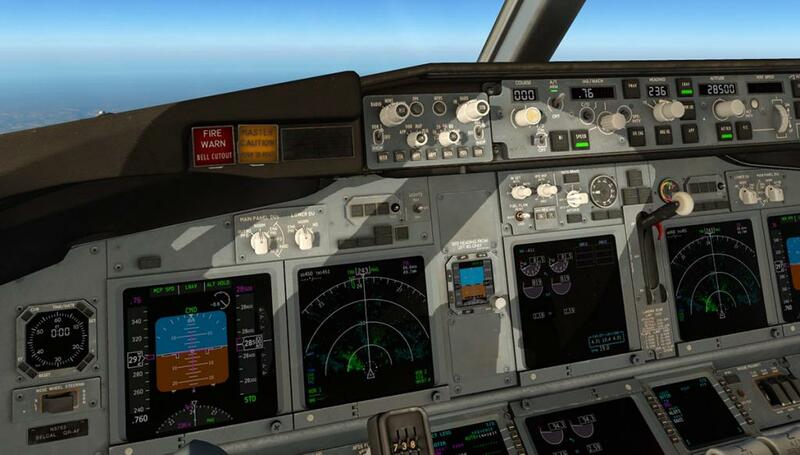 You do have to download a compatibility patch from vFlyteAir and it is a little complicated to install as you have to replace certain files in a few folders (make sure you backup the aircraft first) but when all completed with the install the results are well worth the effort. 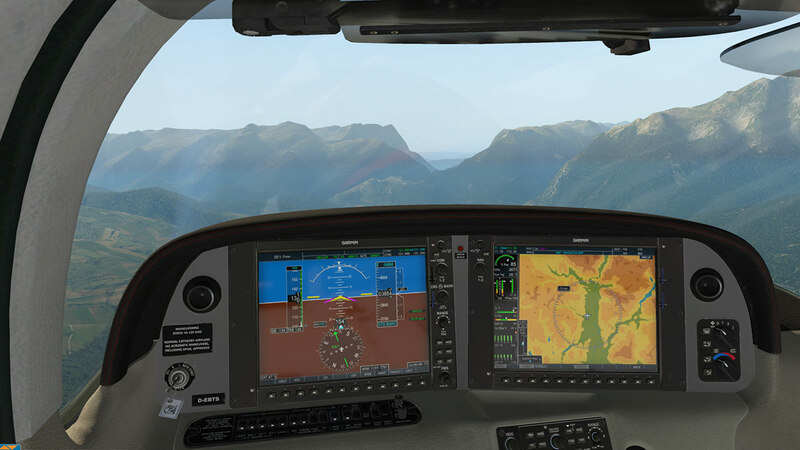 The Cirrus has a hybrid version of the G1000 system called the "CirrusPerspective system" and those screens are large. The TerrainRadar does a really great job with the resolution on such a very large display, but close, close up it is a little out of focus, but that is in the screen display popout mode or if you really want to get picky. But here at Salzberg, Austria, it is very effective. You have the red terrain mode as well, but it is not as detailed. ... it is very impressive, and map rotation is slightly laggard because of the big display, but still far better than most pro screens doing the same complex movement. ... so overall it is excellent. 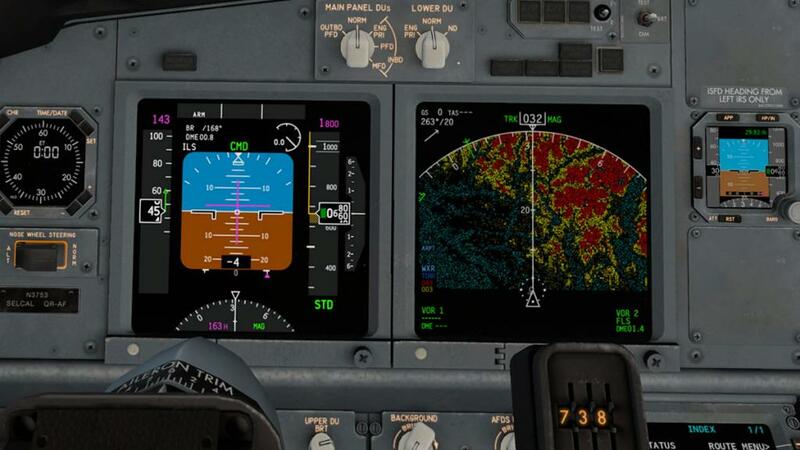 The biggest impact is on just how much the TerrainRadar changes the whole perspective of the SR20 panel's display, it makes it far more, in fact much more a complete G1000 system feel and gives you a completely different viewpoint than the original's display set up, so it is a very worthy addition or feature to add into the vFlyteAir Cirrus SR20 at absolutely no extra cost. X-Plane's Boeing 747-800 is another aircraft like the default Boeing 737-800 that the plugin will work in. 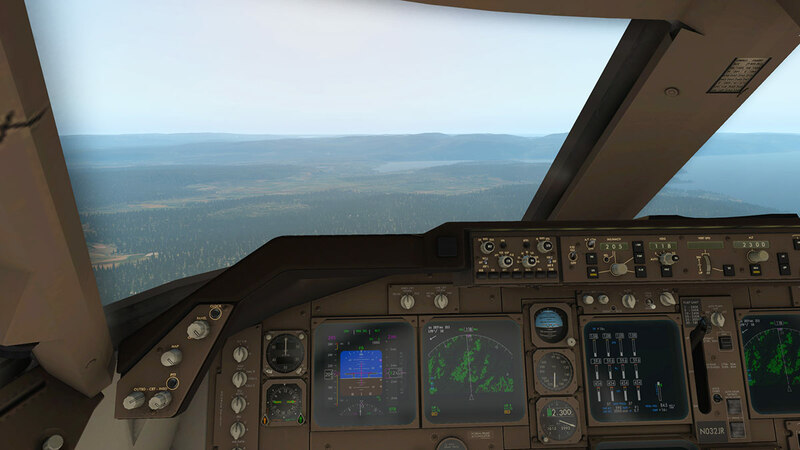 The B744 is a bit older and more dated in it's layouts and so the plugin is shown on a far more smaller display than in the B738, it is far darker as well and that required the brightness of the plugin to be quite bright. 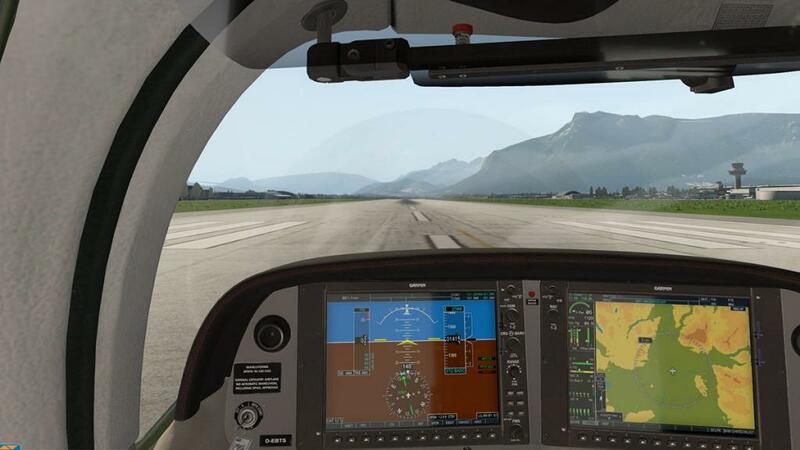 Again the this excellent plugin was highly impressive, and still again you are impressed by the way it changes the display's feel and viewpoint from your flying perspective. 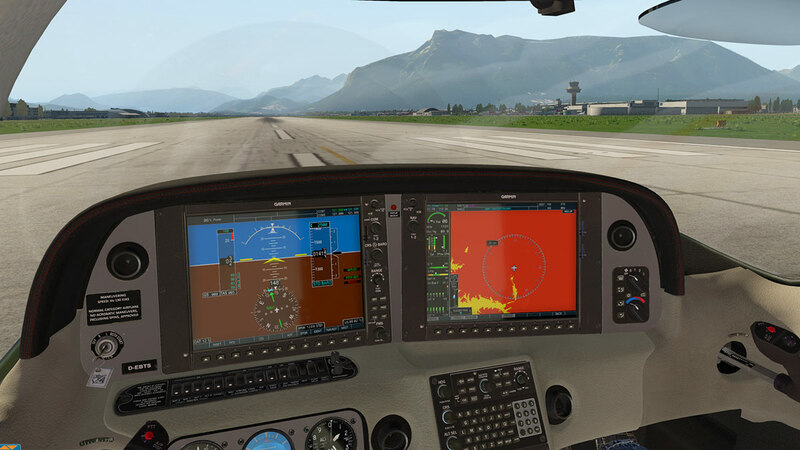 Ddenn's Challenger 300 gets the internal upgrade treatment as well. Again the TerrainRadar is a very nice addition in here as well. But the smaller tighter and very cluttered display does make it complex to see everything (or anything). So unless you really need them, then the fixes (waypoints) triangles (left image) need to be removed from the display to give you a better and far clearer terrain perspective (right image). The "Grain" setting is always the best with these tight displays as both Solid or Regular don't give you as much or any real definition of the surrounding terrain. 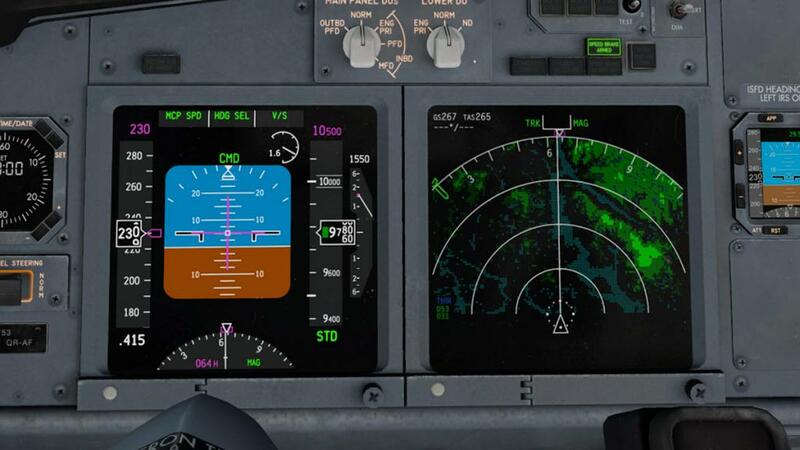 It was the Zibo's Mod of the Boeing 737-800 that highlighted the TerrainRadar's dynamics and potential. The plugin's developers note that it only works on one screen the pilot's in the B738, but I found it works on both the pilot's and co-pilot's displays by pressing the "TERR" button. It is fine on the standard X-Plane version of the B738 as well, so you don't need the Mod in there to use it on that aircraft as well. As with the original features on FlightFactor's Boeing 757 and 767 twin, it is a significant addition to any cockpit display, but there are more adjustments and features like radar range and angle that on those aircraft and it is far more sophisticated in its design. 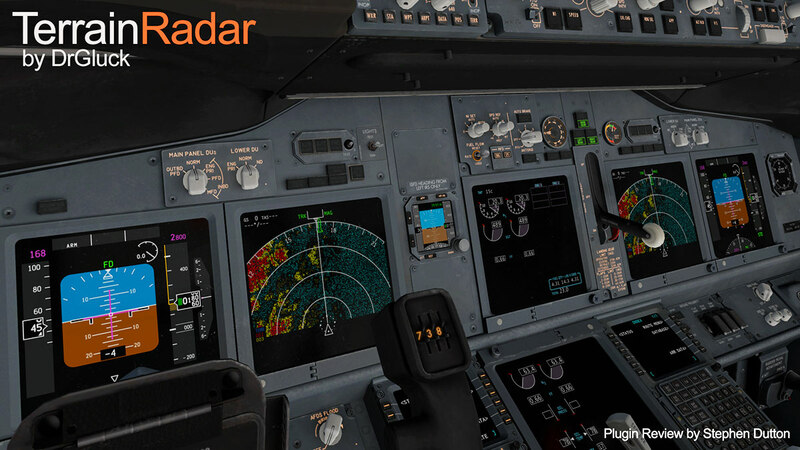 However the TerrainRadar is created to be a far more generalistic tool across more aircraft than the featured FlightFactor design. One thing that is very apparent here with this plugin. 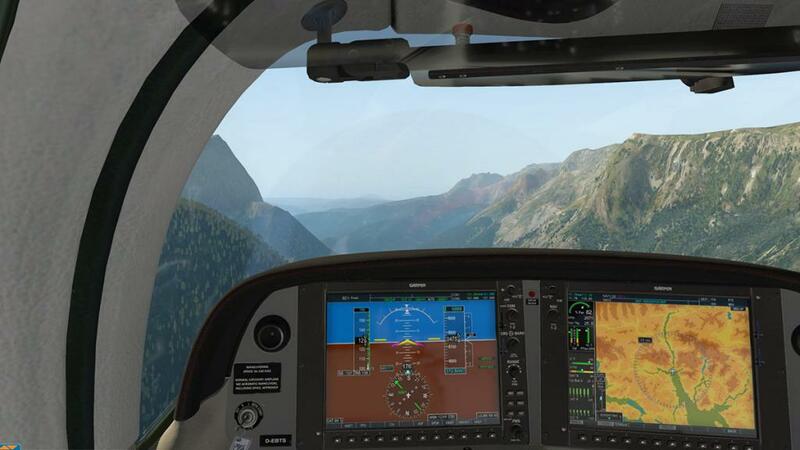 If that any developer does intergrate the terrain plugin with a custom fitting into their aircraft the benefits to them and the aircraft is very high. 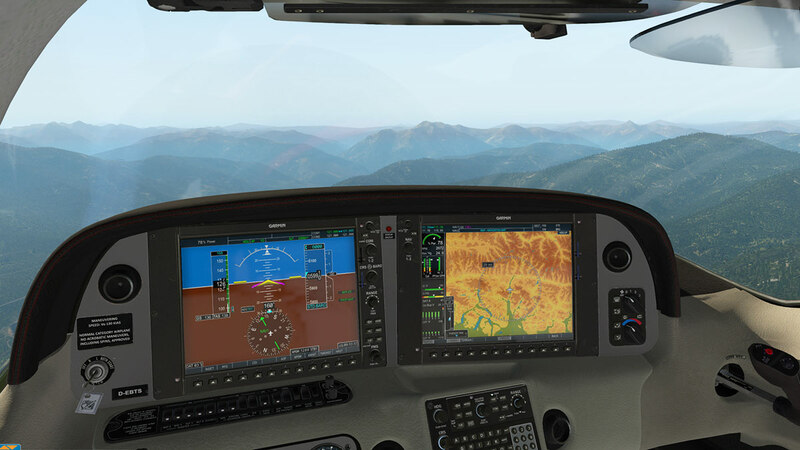 So I would be extremely surprised that the plugin will not start to be quickly intergrated into more aircraft in the future and that list of intergrated displays will soon be quite long and commonplace. Simple and brilliant... 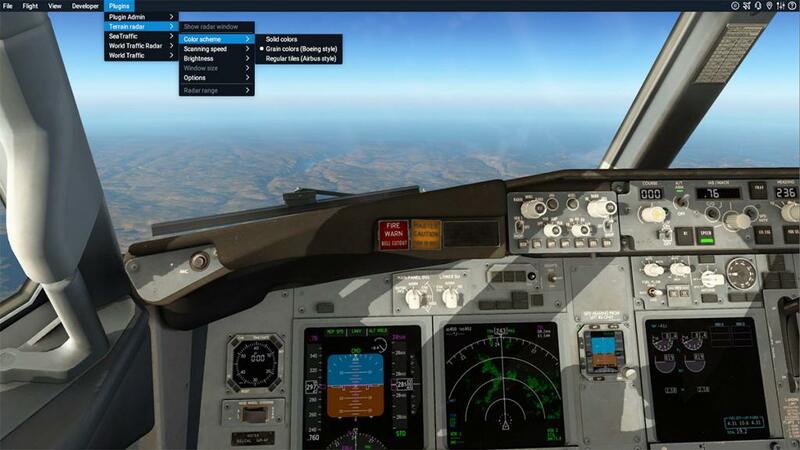 This Freeware tool brings any cockpit map and navigation display alive and dynamic at the same time. Super easy to install and even use and already it is being used in a far range of aircraft in their displays. 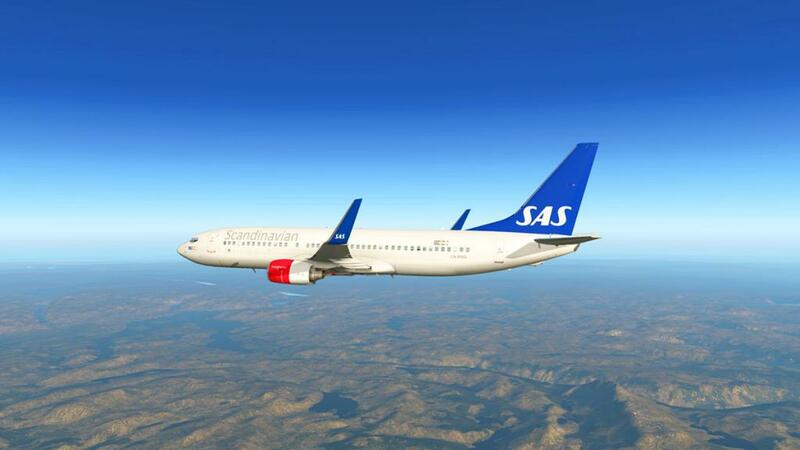 No intergration in the actual aircraft? No problems as you also have a popup window to still use the plugin with the added on aircraft elevation position indicator. It is also very good, but nothing really beats the plugin set up on the navigation display. As noted there will be no doubt we will be seeing this TerrainRadar display tool in many aircraft as it will easily (or should) become a default plugin standard... 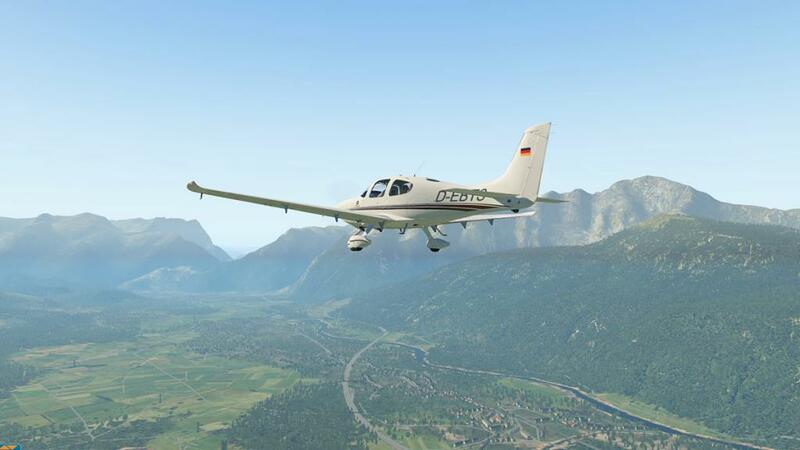 But remember to support the developers in making a nice donation, as this is a very worthy addition to X-Plane. 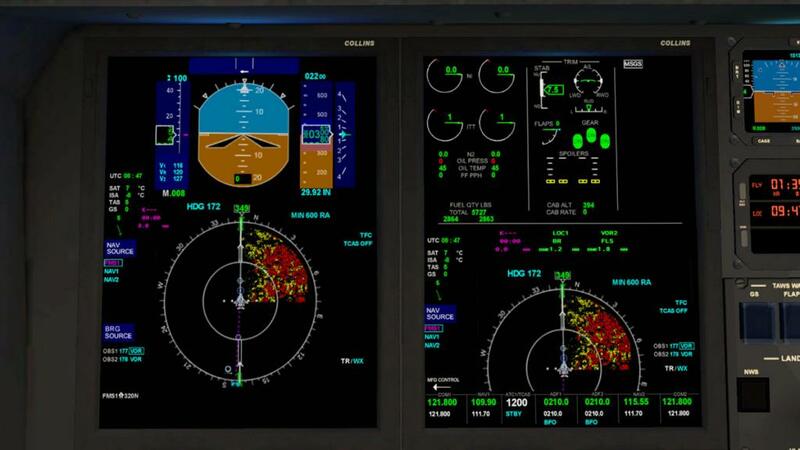 Overall a must have and you will smile every time you look at your aircraft displays on how a big difference it makes to the cockpit... Just brilliant. Installation : Download file size is a whopping 241kb (yes kilobytes). With installation of the plugin into your X-Plane Resources/plugins folder.